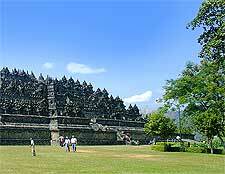 Borobudur is one of the world's most significant and impressive pilgrimage sites for Buddhists. Built in the 9th century as a shrine to Lord Buddha, it was a key site for the Buddhist world for nearly 500 years, until the religion fell into decline. Lost for centuries, the history of Borobudur was resurrected in the 1800s by a British colonial ruler who returned the magnificent temple to the public eye. Today, this temple is once again one of the world's main Buddhist pilgrimage sites. One of the great intrigues about Borobudur is that no one actually knows who built this massive temple complex or why. It is an ancient treasure truly shrouded in mystery. Inscriptions and carvings on the temple walls suggest it was constructed around 800 AD, during the peak of the Sailendra dynasty and Srivijayan Empire of Java. Historians believe it took about 75 years to complete. For centuries the history of Borobudur was lost to humanity, buried under layers of volcanic ash and thick jungle. It is not known exactly when the temple was abandoned completely, but many historians think its downfall was the result of a series of major volcanic eruptions on eastern Java, between the years of 928 and 1006 AD. Borobudur appears once or twice in literature after that time, although its role seems to have shifted to one of bad luck instead of spiritual enlightenment. This could have something to do with the fact that most of Indonesia's island of Java converted to Islam in the 15th century. However, a number of traditional folklore stories suggested that a visit to the temple would bring bad fortune and even death. Though Borobudur was never truly lost of the people of Java, it wasn't until the British ruled the territory between 1811 and 1816 that the temple was put back on the map. The British governor of Java during that period, Thomas Stamford Raffles, had a keen interest in the history of Java. In 1814, he was told of a great monument hidden deep in the jungle. Though Raffles was not able to venture there himself, he sent Dutch engineer H.C. Cornelius to see what was there. After two months, Cornelius and some 200 men cut their way to the site of Borobudur and reported back to Raffles about their discovery. Raffles, of course, got the credit for discovering Borobudur. In 1902, the Dutch East India Company decided to invest considerable time and money restoring the temple complex. Slowly they worked to uncover and restore the massive structure, but it wasn't until 1960 that the Indonesian government asked the international community to step in and help them finish the job. 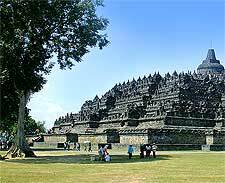 From 1975 to 1982, UNESCO and the Indonesian government undertook a major restoration of the entire site. 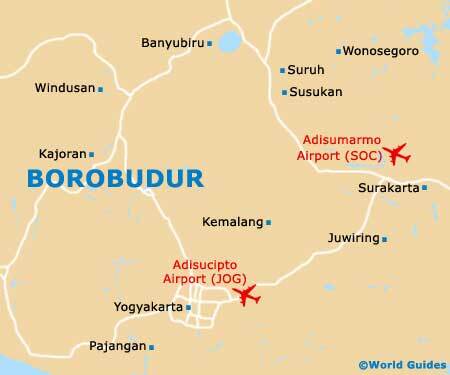 Upon completion in 1991, UNESCO declared Borobudur a World Heritage Site. Today, the temple is the most-visited site in Indonesia, and each year well over three million people come to witness the marvel of this homage to Lord Buddha and his path of enlightenment.